Producer of "Swim Team," a forthcoming documentary about reaching beyond disability towards a life that feels winning. Eric makes his rounds delivering packages at Zendesk, a San Francisco-based tech company that champions inclusion of individuals with autism and other disabilities in the workplace. 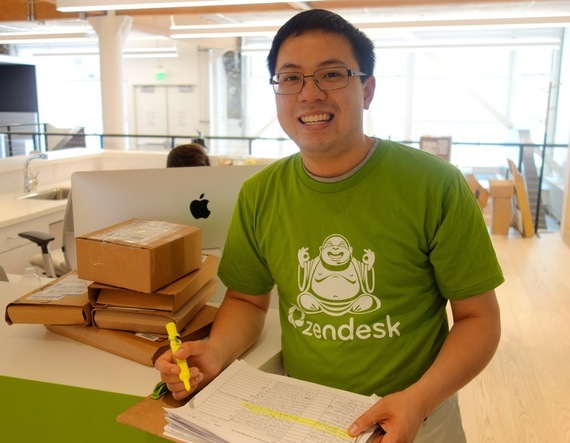 Eric was matched to Zendesk through The Arc San Francisco. Something curious is happening in Corporate America. Business leaders are discovering a whole new source of talent they never realized existed: people with autism and intellectual and developmental disabilities. Of course, this population has been there all along. But now that their bottom-line value is beginning to be understood, best of breed companies are competing to capitalize on the myriad opportunities presented by hiring people who, until now, have been roundly ignored. The compelling advantage for everyone involved in disability inclusion is why the United Nations General Assembly chose employment as the theme of the 2015 World Autism Awareness Day on April 2nd. On that day, the UN General Assembly will launch an employment "Call to Action," inviting businesses to make concrete commitments to employ people on the autism spectrum. But before we get to the hopeful trend on the horizon, let's sober up with a reality check of the moment. For people with disabilities, unemployment is still the overwhelming norm, regardless of the ability and desire to work. According to the U.S. Bureau of Labor Statistics, working-age people with disabilities can expect to be employed at only one-third the rate of people without disability. If they're lucky enough to land a job, these folks should brace themselves for outrageous gaps in compensation. And this may actually be too rosy of a picture. The Arc, the nation's largest organization for people with intellectual and developmental disabilities, has found through its own research that the employment rate for this population is probably closer to a measly 15%. "There's a radical lack of awareness in this country about the unemployment rate for people with developmental disabilities," notes Ann Cameron Williams, former Arc leader and current CEO of consulting firm ao Strategies, which primarily advises nonprofits serving people with intellectual and developmental disabilities. Among the many barriers to employment for people with autism and developmental disabilities, stereotypes are at the top of the list. "Years ago, most people just assumed that people with autism were less employable," says Peter Bell, President and CEO of Eden Autism Services. "Surely, the thinking went, with such a profound disability, these people couldn't be successful in employment." "It's a huge system issue," notes Williams. Whatever interventions are brought to bear to help kids with autism and developmental disabilities, the lion's share of support usually happens through schools, where these kids are, to at least a minimal degree, interacting with their peers and community. "Then between 18 and 22, the kids graduate and you dump them into the social services system," says Williams. The challenges facing people with disabilities like autism often manifest themselves in a processing delay, but many will succeed if given more time to develop the skills needed to carry them through the workplace. But the support systems to help them achieve post-secondary success are slim. "It's as though the system says you stop learning at 18," says Meredith Manning, Director of Communications for The Arc San Francisco. "Think about that. What would you be like if you stopped learning at 18?" Manning and others believe that people with autism and developmental disabilities are, for the most part, simply not given the chance to succeed. "After the supports start disappearing at age 18, the system pretty much says, 'You're on your own - go figure it out,'" notes Manning. As such, many parents are limited to thinking about how to protect their children. "They've never been supported in considering, 'what is my dream for my child?'" 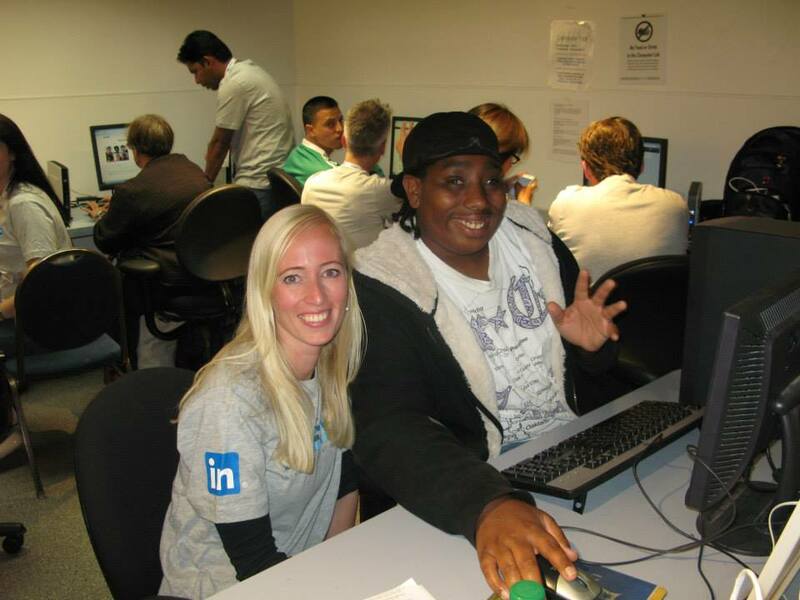 Volunteers from LinkedIn help Arc clients boost their job prospects through the company's well-known networking platform, and get a few tips on making the interface more accessible for people with disabilities. Indeed, for too long the prevailing focus of helping people with autism and developmental disabilities has pivoted not upon dreams, but safety. These were people who needed to be shielded from the world, the thinking went. So the progressive model that began decades ago centered around funneling people with developmental disabilities into "sheltered workshops," cloistered facilities where people with disabilities can work within a virtual bubble. The problem is that these workers are typically assigned simple, piecework tasks that never change over the course of years, even decades. They experience no opportunity for advancement or career development. They're given sub-minimum wages, which is still legal in most states for the disabled population alone, and then paid through a third-party agency rather than directly by their employer. "It's a human containment model," says Manning. 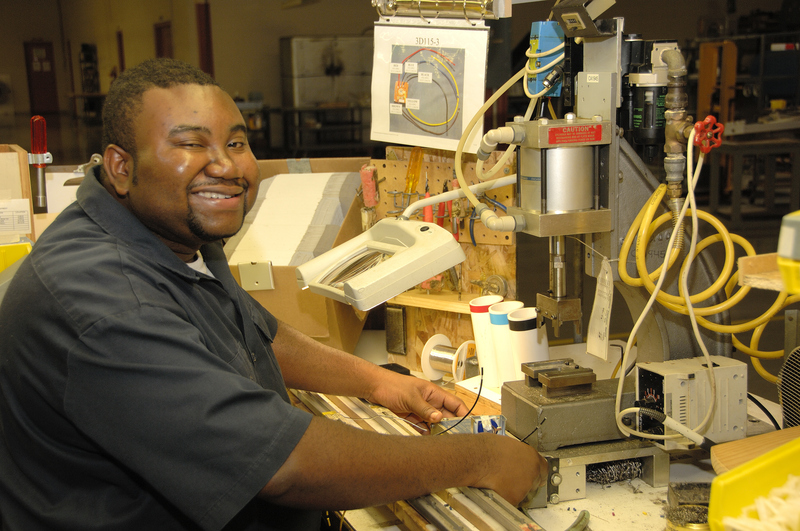 The sheltered workshop approach is still how many nonprofits support employment for people with disabilities today. Some might argue that this system can work well, particularly for those who have trouble interacting socially or focusing. But the Justice Department disagrees. Just last year, it settled a landmark case with the State of Rhode Island to dismantle its system of workplace segregation, which the Justice Department charged was a violation of the Americans with Disabilities Act. Instead of fighting this charge, Rhode Island agreed to get its house in order like other leading states and reallocate its resources over the next ten years from sheltered workshops to community models of employment. The court-approved agreement, known as the Consent Decree, sounds the alarm for other lagging states to follow suit and move towards inclusive modes of work, where people with disabilities are provided with support, training, interaction with the community and the same rights as typical employees. As the old approach towards employment recedes into disfavor, by choice and by law, an exciting new path forward is unfolding that re-imagines the possibilities for people with autism and developmental disabilities. 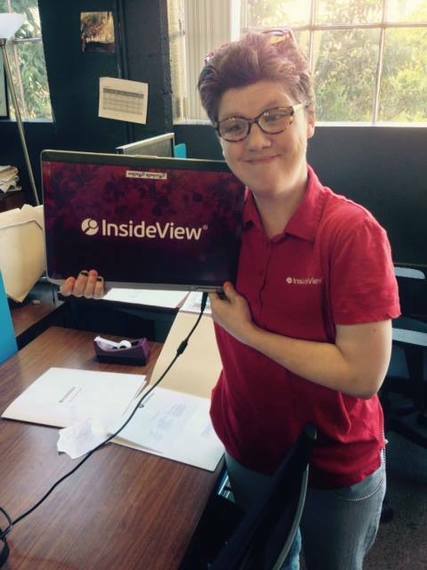 Pursuing her dream to be a journalist, Michelle hosts her own podcast, A View From My Window, at The Arc of Indiana. Her goal is to interview Anderson Cooper. Many nonprofits haven't had to be dragged kicking and screaming by the Feds to a community-based model of employment. They've seen the overwhelmingly positive results for people with developmental disabilities and have long been proving the success of this approach. Interacting within the community and being treated like a typical employee, gaining skills and self-esteem, being rewarded for good work with opportunities for advancement...all of this, unsurprisingly, leads to more positive outcomes for people with autism and developmental disabilities. It's also great therapy and a valuable intervention, often eliminating negative behaviors and reinforcing positive ones. "People with autism are absolutely employable," says Bell. "If given the right supports, there's no reason to think that anyone couldn't have a job." Nonprofits like Eden Autism Services are ensuring that the right support is available, starting as early as high school. Eden offers an extensive range of services for people with autism, including vocational and skills training and job placement based around the strengths and interests of its participants. "We're making great strides in getting the corporate world to recognize that people with autism have very good skills that manifest themselves in different ways," says Bell, who leads the 40-year-old nonprofit based in Princeton, NJ. "The challenge for our participants and their families and supporters is to try to figure out what it is that they are good at and like to do, and how can we get the best out of these individuals." Eden Autism Services adult participants on the job at Wawa take a break from stocking shelves to meet with Eden's President & CEO, Peter Bell. Wawa, a big supporter of Eden's employment program, has been employing participants with autism from the organization for over 35 years. Across the country, the evidence is becoming inarguable: getting the best out of these individuals stems from an inclusive, not exclusive, environment. And inclusion doesn't just serve people with disabilities. It turns out that diversity inclusion has profound benefits for companies as well. And here's where that hopeful trend kicks in. For starters, increasing research shows that people on the autism spectrum tend to have a greater attention to detail than their typical peers, and are stronger at certain abilities such as pattern recognition and logical reasoning. These are all qualities that can be enormously helpful to businesses. "More and more companies out there are realizing that there's an untapped pool of talent that makes for very good workers," Bell notes. "Employers are becoming interested in hiring these people not because it's charity, but because it's the right business decision." The Hyatt Regency Princeton, is one of these employers. The Hyatt team joined with Eden Autism Services to place a small group of Eden's participants in jobs at the hotel, working under the supervision of job coaches provided by Eden. Charlie Banta, General Manager of the Hyatt, has seen how the experience serves not only the employees with autism; it engages all of Hyatt's employees and enriches the entire work culture. "There's a certain pride of ownership that happens - a pride in seeing the development in these individuals. The growth is clearly evident and it makes everyone feel good." The return that Hyatt gets for its support of these employees is multi-fold. 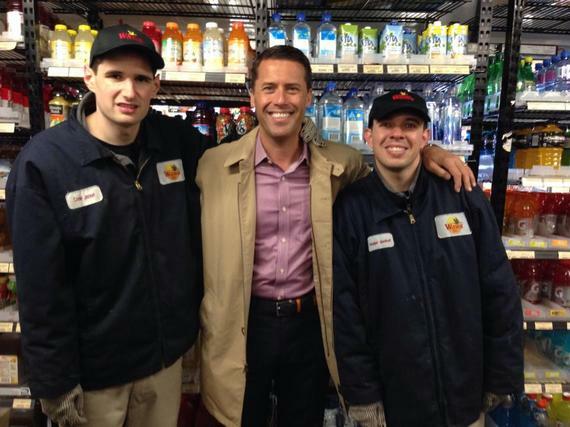 "People with disabilities, including autism, can be very dependable employees," says Bell. "They've never been given a chance, and when they are, they're very loyal." Bell has arranged for other companies to observe the Eden participants in action at Hyatt to understand what it would be like to hire people with autism. "Some companies may come in and think of this just as charity," says Banta. "But it's not. The employees with autism are playing an important role. When visitors see it in action, how our typical team members work side by side with the ones with autism, when they see how much the Eden participants love their jobs and how happy they are to be productive and be around others, then they get it." Joelle and Matt of the Princeton Hyatt working side by side, "because teamwork makes the dream work." As Corporate America begins discovering the promising workforce right in its midst, the nonprofit sector and progressive thinkers within companies are developing exciting new ways to advance and support this growing interest. "There are these mountains of innovation that are happening," notes Williams. Many of these leaders "have their hand on a different part of the elephant. It's stunning." What kinds of mountains and elephants are we talking about? The Arc of Jefferson County in Birmingham, Alabama has a tough time placing its participants in jobs because many of its people have been institutionalized for behavioral issues and can't pass background checks in the interview process. So the nonprofit began copying franchise models and building its own separate businesses - (yes, you read that right), ranging from a bakery to a shredding company, all for the intent of training and employing its own people. "We work with the hardest of the hard, people with severe disabilities and behavioral issues," says President and CEO Chris Stewart. "But these individuals help us build these companies and it becomes their company. We see time and again how these people can get and sustain jobs, and once they're given a shot their behavioral issues go away." At that point, the participants become proven entities who can more easily find other jobs in the community. Stewart calls their wildly entrepreneurial approach "a belief in the dignity of risk." Josh handles document destruction at RecyclABILITY, an Alabama-based company created by The Arc of Jefferson County as a workplace training ground and place of employment for its participants with disabilities. The Arc of Indiana, in Indianapolis, has taken this approach one step further by committing to build a Courtyard by Marriott hotel which will house a training institute to provide a postsecondary opportunity in hospitality, food services and healthcare. "People with disabilities want to work, earn a paycheck and pay taxes," says Kim Dodson, Executive Director of The Arc of Indiana Foundation. "Our goal is to reduce dependence on government assistance and increase independence." Toward that end, students from around the State of Indiana will live at the hotel while attending classes and completing an internship to develop the job skills necessary to be successful. Once participants complete the program, they will return to their home community to begin working. The program includes job skills, work readiness and assistance in securing a position. After earning an Associate of Science degree from Vincennes University in Indiana, Karla went to work at KCARC. She enjoys the independence that a paycheck provides. The Arc San Francisco believes that learning is a lifelong journey for everyone, disabled or not, and their mission is to redefine expectations and supports with academics, linkages to colleges and careers, internships and meaningful jobs. To accomplish this, The Arc SF is capitalizing on the city's tech sector and progressive spirit to help train and employ more than 700 current participants. Through customized approaches to community-based employment for competitive wages, The Arc SF is working with corporate giants such as Salesforce, LinkedIn, Twitter, Intuit, Deloitte and PG&E to integrate people with autism and developmental disabilities into their companies. The program, which typically starts with internships and moves towards career tracks, has been paying off hugely for the participants, their typical colleagues and company number-crunchers focused solely on performance - all of whom are almost always positively impacted by the experience. What the Arc SF is achieving through these corporate partnerships, says Williams, "defies the odds of gravity." "The tech sector in particular really gets it," says Manning. "Company leaders are placing a really high priority on diversity, and working with our community is as exciting for them as it is for us." As word of the success of these programs spreads, Manning sees how the competitive nature of companies takes root and spurs other businesses to figure out how they can get into the game and connect with people with developmental disabilities. "The idea of diversity is being redefined," she says. "This is really working." Michelle, supported by an Arc SF Job Coach, is moving up the ladder at InsideView, having been promoted to Office Assistant Coordinator. And when people with autism and developmental disabilities move into jobs within their communities, the positive economic and emotional effects cascade beyond the workplace and into their own homes. "Eighty percent of families who care for a person with developmental disabilities report that without the support of community-focused organizations, one parent would need to stay home from work just to care for that child," says Manning. If the child is working and becoming independent, parents and caregivers can themselves hold jobs. "There's less drain on the system when you turn your mindset away from social services and towards an approach of lifelong learning and achievement." As companies realize that hiring people with disabilities isn't just a nice thing to do, but something that directly increases profitability, diversity suddenly becomes a lot more appealing. Walgreens offers one of the earliest success stories demonstrating the return on the investment in disabled employees. Randy Lewis, its former senior vice president of logistics and distribution, developed and built a distribution center in Anderson, South Carolina with a commitment that one-third of its employees would be disabled, then exceeded that number to reach more than 40 percent. The facility offers universal equipment designs helpful for people with and without disabilities, disability awareness training for all workers, equal pay and equal expectations of performance, and a special program for managers on how to support disabled employees. The result? The Anderson distribution center became one of Walgreens' most successful, touching off a rash of copycat distribution centers within the organization and beyond. The Walgreens example was one of the first to inspire other companies to focus on the unique abilities of people with disabilities. Germany-based SAP, for example, now believes that hiring people with autism offers a "potential competitive advantage" and has been engaged for several years in a global recruiting program to hire these workers for jobs as software testers, programmers and data quality assurance specialists. Ryan works at Carson Manufacturing, an Indianapolis-based company that makes emergency sirens. His supervisor says he is very independent, professional and competent. The United States Business Leadership Network (USBLN) grew from this intersection between capitalism and disability. Originally launched as a subcommittee of a federal agency, the President's Committee on the Employment of People with Disabilities, USBLN has evolved into an independent, national nonprofit dedicated to helping businesses increase performance by leveraging disability inclusion in the workplace, supply chain and marketplace. The driving ethos of the organization is that business responds to its peers; if a company's competitors are showing positive returns to their shareholders, that company will want to follow suit. USBLN shares and supports best practices in disability inclusion, helping businesses uncover their specific barriers to people with disabilities and then create solutions. The organization has 50 local affiliates across the country and represents more than 5,000 companies, including many of the Fortune 50. USBLN also runs the nation's leading third-party certification program for disability-owned businesses, and is soon unveiling the first-ever Disability Equality Index, a benchmarking tool to measure compliance with best practices around disability inclusion and support. "Everyone is striving to build an inclusive culture," says Jill Houghton, Executive Director of USBLN. "As companies are on that journey, we see how it drives innovation, morale, better customer service, better problem solving - everything increases for the better as a result of inclusion." Houghton is the first person to tell you that the growing corporate interest in disability inclusion doesn't mean that businesses are lowering their expectations. Quite the opposite. "Sometimes we underestimate people's abilities," she says. "Sometimes in the name of helping people, we hold them back. But businesses - they're just looking for good employees. I see powerful success stories every day. And I believe that business can help motivate the change for people with disabilities." Leading-edge companies are clearly recognizing that more diverse workplaces can be leveraged for the benefit of their disabled employees, their typical colleagues and their own bottom lines. But supporters of people with autism and developmental disabilities hope that this understanding becomes widespread amongst companies of all shapes and sizes, and workplace diversity is soon the cultural norm. That's why, in his address about 2015 World Autism Awareness Day, UN Secretary-General Ban Ki-moon encourages public offices, corporations, and small businesses to have a closer look at the way they perceive people with autism, to take the time to learn about the condition and to create life-changing opportunities. "This important mission can only be achieved," he states, "with appropriate vocational training and adequate support alongside a recruitment process that can allow people to successfully integrate into workforces around the world." Williams wholeheartedly agrees with this directive. "I would challenge every company out there to take on a person with developmental disabilities as a part of their staff," she says. "Not just working on the periphery, but being fully integrated into their organizations. It's amazing what people can do if given the chance." Williams also encourages parents of kids with autism and developmental disabilities to talk to their children from a young age about how they'll eventually go to college and get jobs, which is an easier conviction to hold if diversity is visible within the community. "If more kids with developmental disabilities grow up taking it for granted that they will get jobs, just like everyone else, they will have more power to self-direct their paths." "People with autism--or any developmental disability--want more, and they can do more," says Dr. Glenn Motola, CEO of The Arc San Francisco. "We need to stop poor-streaming people into jobs that are great for starting out, but shouldn't be the job you have to keep for the rest of your life. Let's raise the bar on expectations, support people with real-world, adult learning and advancement opportunities and create the inclusive future we know is possible." So this World Autism Awareness Day, look around at your place of work. And if there aren't any employees with developmental disabilities on your team, ask yourself why not. For everyone that interacts with your business, the inclusion of people with autism and developmental disabilities would, by all accounts, be transformative.